"What on earth is that?" was the less than enthusiastic welcome that greeted the little, black jinnit on her arrival in Cavan on an autumn day in 1998. For the blissfully innocent, a jinnit (or hinny) is the offspring of a mare donkey and a pony stallion. 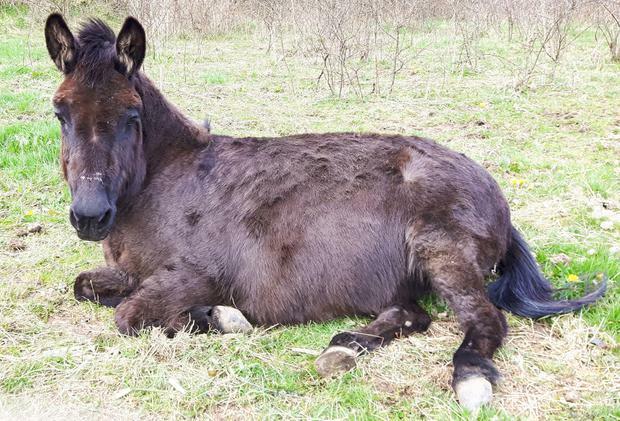 Not to be confused with the more commonly known mule, which is the offspring of a mare horse and a donkey stallion. We had, over the years, some dealings with the horse pound in Saggart. When it was closing its gates for the last time, two unclaimed animals remained. A phone call was all it took and I was on my way to collect the new additions to our motley menagerie. Along with the jinnit, there was a piebald colt who went on to become a wonderful children's riding pony. 'Jenny' very soon let it be known that there was a new sheriff in town! Despite her diminutive size, she had obviously inherited the combined intelligence (and appetite) of both her parental species, a fact that she exploited to her best advantage at every opportunity. No door was safe, she could open the door of her own stable, of the feed room, the chicken house, the gate of the veggie garden, and to our eternal annoyance, the doors of our house. Jenny has an insatiable curiosity. She always needs to know what's on the other side and her intelligence in devising ways of finding out is legendary. She suffers from boredom, and in a bid to occupy her mind, we let her go on loan to a riding school in Donegal. There, Jen came into her own as the most wonderful, careful mount for children. She took part in charity rides, shows, lead rein hunts, riding for the disabled and could even turn her hoof to pulling a little trap. Jenny accompanied many valuable horses on their travels to give them confidence and moral support. She was often seen marching jauntily up the ramp of a lorry to encourage a nervous novice to load. Having got her charge safely on board, Jenny would hop merrily out through the groom's door, laughing behind her hoof at another fool horse duped. Now, at 25, Jenny nannies the foals in Cavan for the winter after they are weaned, and in summer, she goes to her summer job in a trekking centre in Donegal where she is the most-loved and pampered jinnit in Ireland. Thank you, Jenny, for 20 wonderful years and for, hopefully, another 20 to come.